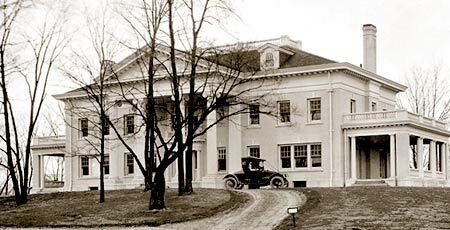 Completed in 1914, Hawthorn Hill in Dayton was designed by Wilbur and Orville Wright with the aid of the Dayton architectural firm of Schenck and Williams. The Wrights wanted a home in the Georgian Colonial style they had admired on a trip to Virginia to test their airplane. As the Wrights' fame grew so did their need for a larger home that would better accommodate their many guests. Therefore, with the consent of their sister Katharine, the Wright's purchased a 17-acre wooded tract named Hawthorn Hill for the many hawthorn trees covering the hillside. In 1912, shortly after approving the final plans for the house, Wilbur died. Orville dedicated himself to overseeing the construction of the residence, spending as many hours as possible at the construction site. The house was also equipped with many labor saving devices and gadgets of Orville's design including a special system of chains and rods that allowed him to control the furnace from upstairs and an early version of a water softener that purified water for use in a large shower. He fashioned special tools to aid in cleaning the residence, a toaster capable of slicing and browning bread, a buzzer system between the dining room and kitchen and an easy chair with a reading stand and matching adjustable footstool. Oakwood High School is only two blocks from Hawthorn Hill, and Orville would sometimes pass by the school on his way to downtown Dayton where he had his laboratory. According to residents that lived in Oakwood, Orville liked to drive fast and he routinely ignored the City of Oakwood speed limit. The Oakwood police, however, never stopped him. It was reported that they just crossed their fingers, hoping that he wouldn't have an accident. They had good reason to be concerned, Orville didn't believe in carrying insurance. The Oakwood mansion that Orville called home for nearly 35 years, will be available for educational tours. Dayton History will conduct the tours while the Wright Family Foundation will continue to own and manage the property. This joint venture marks the first time that the structure will be accessible on a regular basis to the general public. This property is located at the corner of Park and Harman Avenues. In 2006, the NCR Corporation, long the proud proprietor and dutiful caretaker of the property since 1948, announced that it was returning the property to the Wright family and the Wright Family Foundation, an affiliate of the Dayton Foundation.